In Dr. Steven Gundry's breakout bestseller The Plant Paradox, readers learned the surprising truth about foods that have long been regarded as healthy. Lectins—a type of protein found in fruits, vegetables, legumes, dairy, and grains—wreak havoc on the gut, creating systemic inflammation and laying the groundwork for disease and weight gain. Avoiding lectins offers incredible health benefits but requires a significant lifestyle change—one that, for many people, can feel overwhelming. Now, in Plant Paradox Quick and Easy, Dr. Gundry makes it simpler than ever to go lectin free. His 30-day challenge offers incentives, support, and results along with a toolkit for success. 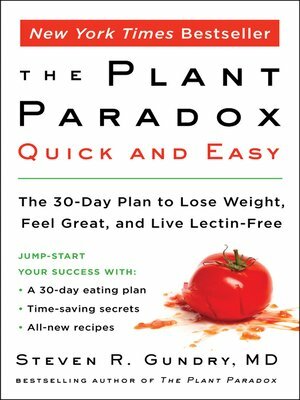 With grocery lists, meal plans, time-saving cooking strategies, all-new recipes, and guidance for families and those following specialized diets (including ketogenic and vegan), Plant Paradox Quick and Easy is the all-in-one resource Plant Paradox fans and newcomers alike need to jumpstart results reap the health benefits of living lectin-free.